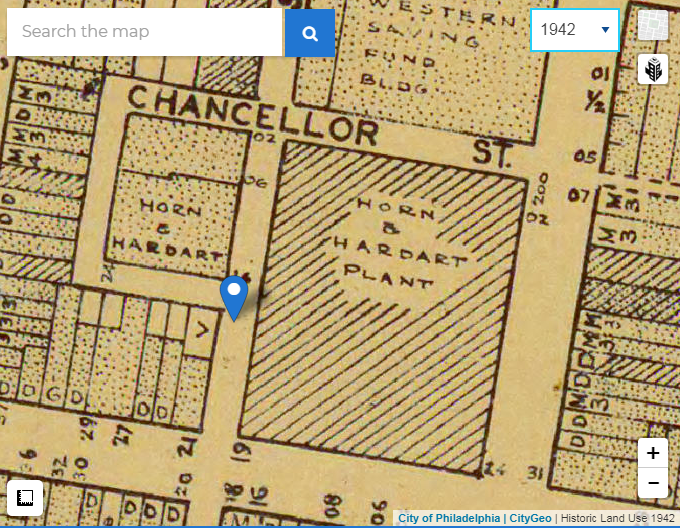 Philadelphia's new Atlas property search tool. In a city as old, big and constantly evolving as Philadelphia, easy access to property data can make all the difference in the world when making informed decisions, planning projects and getting ahead of deadlines. If you have to navigate half a dozen applications to find all the relevant information about an address, a block or a surrounding neighborhood, there's a good chance important details will slip through the cracks. That's how things got done in Philly for a long time, but not anymore. Today, after more than three years in development, Philadelphia's CityGeo team officially launched Atlas, a revamped search and mapping tool that brings together all city property information in a single, tabular and visual application. "If you look at all the data that the city publishes, with very few exceptions, it all has a location component," said Mark Wheeler, Philadelphia's Chief Geographic Information Officer in the city's Office of Innovation & Technology. "You either have an address or it's information about what's happening at a location. We've had an app out for several years that produces individual maps on phila.gov, and those are great, but they're just individual snapshots of information. You can't really layer those things and get any kind of context." Atlas now solves that problem for developers, city officials, property lawyers, community groups and members of the public. In one place, you can now access a wealth of information about where you live, where you're moving and where you hope to build. All of Philadelphia's zoning and deed data, previously available only on the Department of Records' subscription-based Parcel Explorer app, has now been rolled into the multilayered Atlas tool. "We really focused on the needs of our city staff and the needs of real estate professionals, who research title lineages and things like that," said Robert Martin, an application developer for Atlas. "We do see this as having potential for answering more questions from the public. 'I live at this address. Where do I vote? Where will my kids go to school? What’s my trash day?' It’s sort of like your user’s manual to your address. We’re hoping to expand our content in the future." Atlas already offers a full suite of search capabilities for various quality of life indicators—crime, schools, Registered Community Organization districts, 311 requests and vacant properties, to name a few. For the general public, the app's "Nearby" tab pools together data to give users a complete look at what city agencies and citizens are reporting about a given location. Even a complaint about graffiti on a blighted property, for example, is within reach on Atlas. You can pull up a resident's submitted photo of the graffiti, see when it was reported and determine when it was addressed. "'Nearby' is a set of functions that our council staff had asked for because of a number of requests about vacant lots, illegal dumping, poor management and crime around the area," Wheeler explained. "We put this together so they can answer a set of questions more easily." For those in the world of real estate development and urban planning, Atlas goes even deeper. Dating back to 1996, the city has been gathering low-altitude aerial imagery through a contract with the private firm Eagle View. 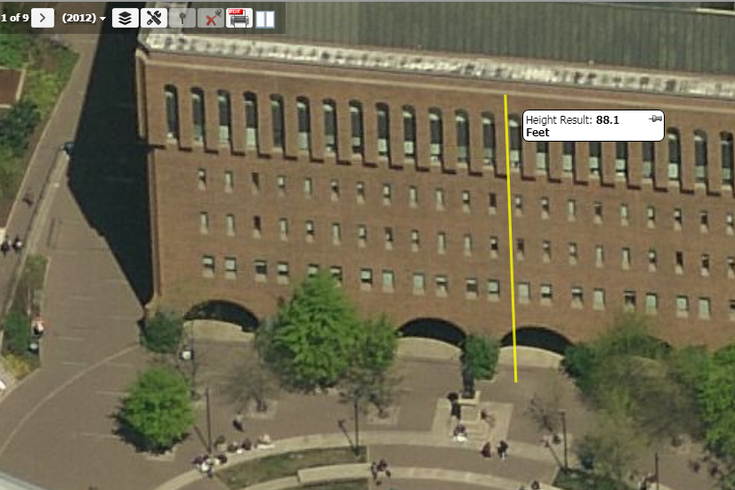 The Pictometry tool in Atlas enables users to scroll across a detailed urban map, comparing views over time and taking accurate measurements of a building's height, the area of a property and the distances between various geographic points. Historical land use maps stretch as far back as the early 20th century. 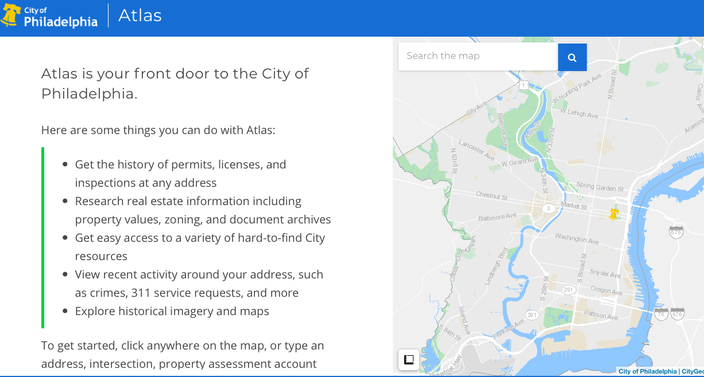 City agencies are beginning to incorporate Atlas into their own public databases as well. CleanPHL, for example, has already picked up the app for its location-based litter index search tool. All told, Philadelphia is running ahead of the curve for property data integration. "There’s a number of cities that have APIs out there that may not be as expansive," Wheeler said. "I think with the level of information that we’re providing and how elegantly it's stitched together, Atlas is just this beautiful, seamless application to go across all of that information. Other cities don’t have the complexity of a deed representation versus a tax lot representation. They don’t all have the aerial imagery that we have or the Pictometry access, the complexity of zoning and zoning overlays and [Registered Community Organizations]. To put this all together on one site is unique." Interested in learning more about Atlas? Members of the public are invited to attend an open house on Wednesday, Nov. 14 from 5-7 pm in the city's Innovation Lab, located on the 16th floor of the Municipal Services Building at 1401 JFK Boulevard. Join CityGeo team for a Map Measure Open House Nov. 14 from 5-7pm!